The title of this post was supposed to be The Temperature and Altitude of Radiation to Space. With a bit of luck and perseverance that post will happen, but we’ve had so much trouble, the trouble itself seems to warrant a post. We had discussed the temperature of radiation to space in a “mark with chalk, cut with a chainsaw” kind of way based on MODTRAN graphics below. 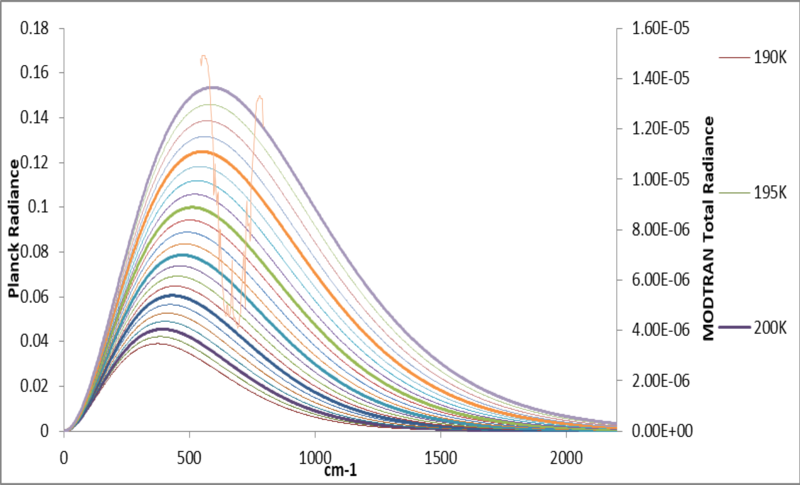 We see that CO2 takes a gap toothed bite out of the Planck radiation curve and that the bottom of the deviation conforms to and matches the 220 K Plank curve in a general sort of way. The “P” and “R” rotations surrounding the fundamental bend conform generally to 220 K, but the fundamental “Q” branch itself jumps up to something like 240 K, and the other absorption lines fall unsatisfyingly between the 20 K Planck increments. We want a much more precise way to judge the radiative temperature. 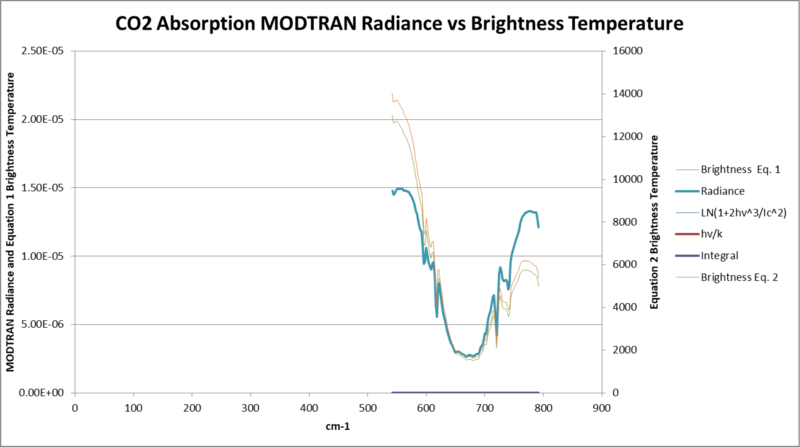 Unfortunately, our MODTRAN gap toothed bite was some 4 orders of magnitude less than the Plank units, and even when scaled on a secondary axis did not match the MODTRAN graphic in either implied temperature or units. Rats! In trying to understand why, we noticed that the MODTRAN graphic is in units of Intensity W/m2/cm-1. These units are commonly used for Irradiance or incident radiation as opposed to Radiance or radiant exitance per solid angle. In fact. 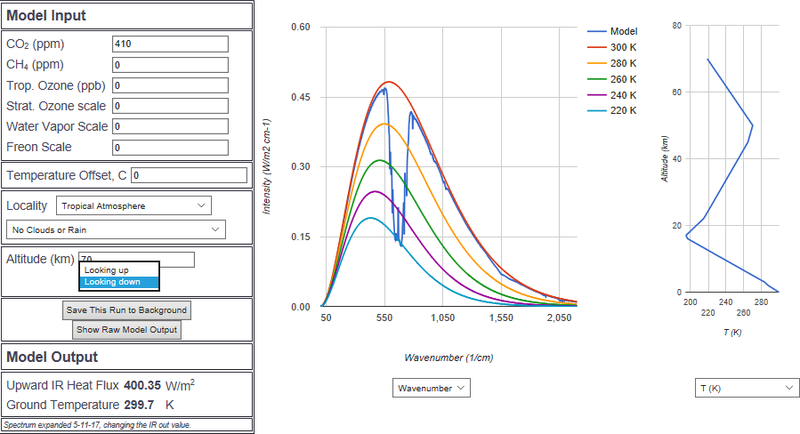 Planck curves in units of Irradiance match the units in the MODTRAN graphic, but this left the unwelcome task of converting the model output in Radiance to Irradiance. This is a can of worms in its own right, and involves transcendental numbers. Even if we could reproduce the MODTRAN graphic with 5 degree Planck increments, we would still be interpolating. What we really want is a Planck temperature for each wave number’s total radiance. Brightness temperature seemed to fit the bill. It basically treats each wave number’s total radiance as the maximum intensity of a new Planck curve to derive the temperature. Using the equation above we got brightness temperature in the ridiculously low units on the left, somewhat like of the microwave background radiation from space. We found another brightness equation that used base 10 log and used the physical constant “C1”, which is 2hc^2 in a way unfathomable to us. Remarkably, the two different equations scale closely, with Eq. 2 giving units to the right in the range of nuclear fusion in the sun. Brightness and radiance scale closely, with the difference increasing in shorter wavelengths. A fine kettle of fish! We still don’t have reasonable temperatures by wave number.